Check out these custom painted poppers. I’m a sucker for anything I can put the TinBoats name on. When I came across the South Shore Fishing Supply Facebook page and I saw that they could make custom painted and branded lures, I knew I had to jump on it. Am I glad I did. In typical fashion, I ordered one for me and the rest to giveaway. The lures themselves came out awesome. 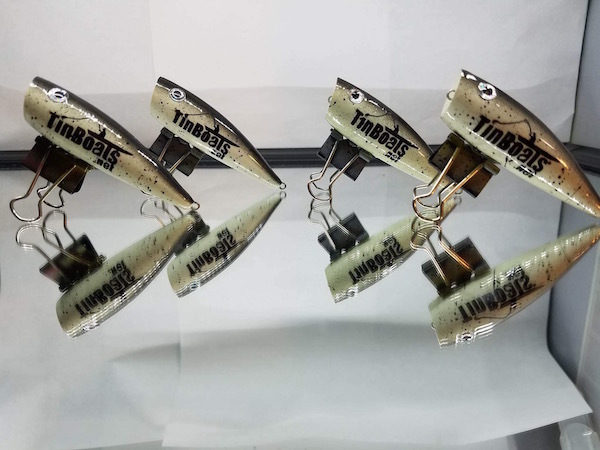 If you need some custom branded cool marketing materials like these lures, reach out to the folks at South Shore Fishing Supply through Facebook. Here is your chance to own one of only four in existence. Winning this lure puts you in an elite group. Knowing that you will be one of four others who will ever own this lure…..WOW! This lure is going to catch the next world recored fish no mater what species you are targeting. I’m not going to use mine, the lure itself is the trophy. The lure will also come with a stand for you “collectors”. All you need to do is Reply with “IN” below. I will pick a winner through Random.org on July 4, 2018. God Bless America! Do not worry about your email address, I don’t save them, use them, or sell them. I contact the winner via email and that’s it. 2, Pray to the fishing Gods that you win! Disclaimer: Everything can change because.